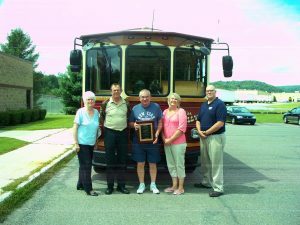 Management members of the STS staff present Mr. Mike Micko (center), Retiring Executive Director with a plaque of appreciation for his years of service and dedication to the Schuylkill Transportation System. Mike has been with STS since 1980. Pictured with Mike and offering congratulations are: Left to Right-Ms. Dolly Kuehn, Operations and Safety Supervisor; Mr. Dave Bekisz, Executive Director; Mike; Ms. Dana Moyer, Assistant Director and Mr. Johnny Bowman, Maintenance Manager.